Here's what's happening this month in Broadway's living room. What’s Hot About This One: Some great Broadway talent comes together to sing the hits of the late, great George Michael. A couple cocktails and some George Michael…who could resist? What’s Hot About This One: It’s literally like a home run derby (sports reference) for Broadway belting. This one has Lisa Howard, Farah Alvin, Lianne Marie Dobbs, Laurel Harris, and Brian Charles Rooney all competing to blow the roof clear off the building. What’s Hot About This One: The Grammy-winning star is back by popular demand! There’s nothing like experiencing that incredible voice in the intimate basement venue. What’s Hot About This One: Listen to those vocals! This former Glinda is a true powerhouse performer and her solo debut is an absolute blast. Get ready to remember why you love Broadway and the leading ladies who perform it. What’s Hot About This One: Michael is joined by Bbox fave Whitney Bashor for a night of cool, new musical theatre arrangements performed by two rising stars on Broadway. What’s Hot About This One: We make no secret for our love of breakout Broadway star Carmen Cusack. Considering her last show was a sold-out hit, this return engagement may very well be the concert event of the month if you can get in. What’s Hot About This One: It’s Linda MF Eder people! See the original Jekyll & Hyde star live and hear those soaring vocals from only a few feet away. What’s Hot About This One: The blurb for this show sounds hysterical. Seems like it will offer just the right nostalgia for a young crowd looking to turn up on a Thursday night. Expect LOL stories and beloved pop and B’way songs from the late '00s. What’s Hot About This One: Tony winner Faith Prince directs the NYC debut of Ari Axelrod in this coming-of-age concert. What’s Hot About This One: The Emmy and Golden Globe-nominated screen star is back at 54 singing some of your favorite songs by kickass female artists. What’s Hot About This One: The current Phantom leading lady brings that stunning soprano to 54 for solo debut concert. You don’t want to miss this sensational talent live and up close. What’s Hot About This One: Broadway’s all but forgotten camp, disco flop gets a new life thanks to this one-night-only concert starring insane-voiced talent Bonnie Milligan as the title character. Charlie Rosen contributes new orchestrations and the score was created by the hit maker behind “Last Dance” and “It’s Raining Men”. What’s Hot About This One: The hilarious and charming Andrew Kober (currently in Sunday in the Park with George) is back with the sixth edition of his popular Koberet series. The one-night-only dad edition features guest star Caissie Levy. What’s Hot About This One: The Honeymoon in Vegas and Who’s the Boss star is singing standards and bringing all that Danza charm to Broadway’s basement. You know the showbiz stories alone will be worth the price of admission. What’s Hot About This One: Some serious Broadway talent (like to list them would be too long and too much) take the stage to sing true one-hit-wonders from the ;90s and '00s. Get ready to lip-sync for your life from your seat in the audience as they take on these catchy songs engrained in our collective memories. What’s Hot About This One: Drew Gasparini and Alex Brightman team up for the musical debut of It’s Kind of a Funny Story, a musical about the simpler things in life: anxiety, depression, and possible insanity. Those talents paired with a killer cast make this concert presentation one of March’s must-see events. What’s Hot About This One: Broadway favorites sing songs and share stories from musicals that should have played NYC but never made it. The show promises to be entertaining and educational. What’s Hot About This One: This concert is a showcase for incredible high school and college theatre talent. Who knows? You might be in the room when the next Patti LuPone, Audra McDonald or Raul Esparza makes her/his 54 debut. What’s Hot About This One: The former Monkees lead singer and Broadway alum debuts a brand-new solo show which combines his love of showtunes with his love of rock music. What’s Hot About This One: The Aladdin cast member brings an acoustic vibe to 54 for his debut concert show. If you’ve seen his viral videos, you already know this is going to be some concert. What’s Hot About This One: Jose’s solo show about growing up gay and Latino in the South Bronx during the ‘80s and ‘90s was named as one of 2016’s “Top Ten Shows to See in NYC” by Time Out New York. 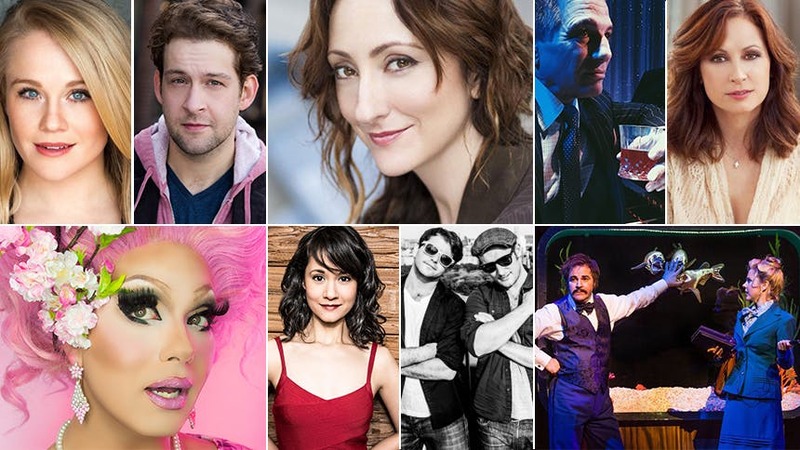 What’s Hot About This One: Broadway heavy hitters come together to break the stigma around mental health and sing an evening of uplifting hit songs. A portion of the proceeds will benefit The American Foundation for Suicide Prevention. What’s Hot About This One: The stars of Disaster! reunite at 54, and lord knows it’s going to be an insane, LOL night! All that talent packed on that small stage is almost too much to handle. What’s Hot About This One: Ok Drag Race fans, Alexis Michelle (upcoming Season 9) is back with her one-of-a-kind cabaret experience. Before all of America falls in love with her on TV, you could see her live at 54. What’s Hot About This One: The singing voice for Ava Gardner and Lucille Ball comes to 54 with Emmy winner John McDaniel on the keys and special guest Aaron Blake (The Met’s La Traviata). Spend an evening in the magic of old Hollywood with these songs and stories. What’s Hot About This One: Another drag artist to see at 54 is former Jersey Boys star Cacophony Daniels (Courter Simmons) as he pays tribute to the Divine Miss M.
What’s Hot About This One: After three sold-out concerts, Bitching and Belting rings in the first of April with more alternative facts than your Facebook feed allows. Get ready to seriously LOL with this crazy cast of characters, all of whom will be belting their faces off.